Well tell me if I am the only one, but after the crazy hot weather in southern California, I am totally ready to get into wearing my cozy Grandma-chic cardigans and high waisted pants with some of fall's new trends. This post is going to be limited to the runway shows but I will be carrying on with the rest of my "BTS" posts this week and next. Enjoy my beautiful readers! :) And don't forget to comment if you are ready for fall to be here already! I don't know what it was about Oscar de la Renta this season (or every season for that matter) but I just adore every piece that came down the runway from him. Magnifique! 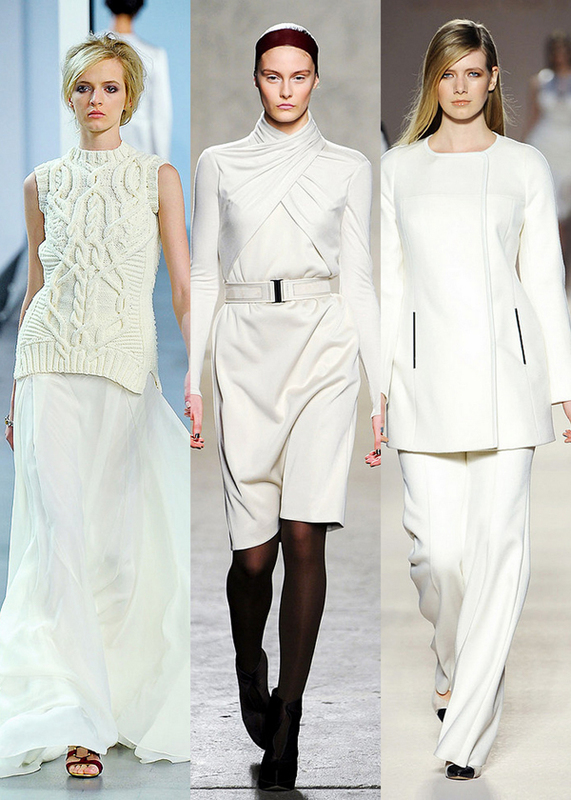 I love the simple yet bold look of white on white. The monochromatic palette lengthens those of us who sit on the lower end of the height scale too! Personally I really like that rather than go all out fur coats like Michael Kors (although I absolutely adore that look), they did fur accents. 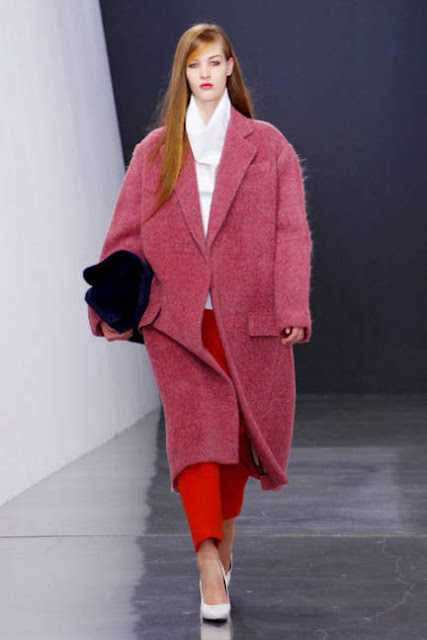 By doing accents rather than big looks like giant fur coats, the trend is made a whole lot more wearable. Does anyone else remember the terrible camouflage pants and jackets and shirts and hats and every other clothing item from way back when? I was only in elementary school when this trend was really popular but to this day I can't stand that trend. When I heard military was coming back for the fall season I did a double take and almost broke into tears (just kidding ;)) Anyways! I was pleasantly surprised to see this military look is very tailored. Much better than the tacky military patterns of the past! Now don't think that just because Calvin Klein used mostly black leather means that you have to stick to this monochromatic palette to pull off the trend. Many other designers stuck with red leather as well. I'm not sure which I like more. I am leaning toward the red leather. It feels more fall to me. But to each his (or her!) own. Ok just to clear the air, I would never be able to pull this trend off. Too much sparkle for me. 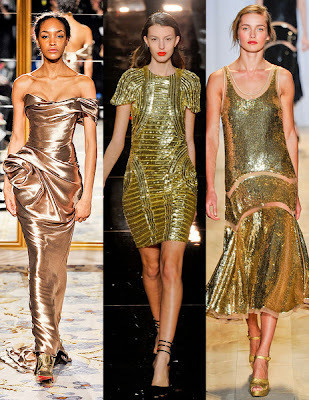 I love being the center of attention (it is the Italian in me) but with this white skin and imperfect body I would not like the heavy metallics everywhere. Plus I like my bold pieces being jewelry, lace, or makeup. Just a personal thing. But for those of you who CAN pull this look off, more power to you! It looks so amazing on some people! 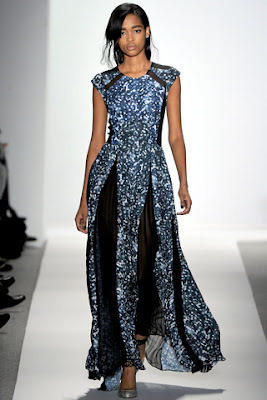 Two homeruns for Jason Wu! I love the way he makes it so ladylike and pretty! Ladylike trends like these (and the ones I mentioned above) are always my favorites. 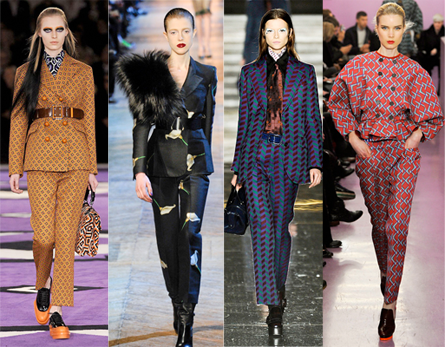 And this trend is definitely the most figure flattering for every body type. It emphasizes the curves of those well endowed and adds curves to those who aren't. 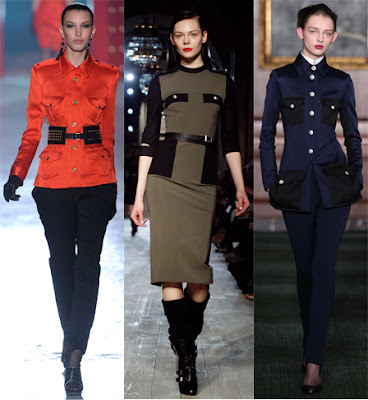 This one makes it into my top 2 favorite trends of this fall and winter. I'm sorry for mentioning this trend and even more sorry if you really love this trend. No hate I promise! But I just do not understand this trend, except for the models who wear exaggerated trends like these every time they walk down the runway. This trend is not figure flattering and just seems overwhelming. Call me crazy but I like defining my lady qualities and keep the loose fitting, large clothing items to the nuns (I'm allowed to say that! I have more nuns as friends than I would like to admit). Well I hope that this was helpful to all you fabulous fashion mavens!!! Keep checking up for more updates:) Have a wonderful week! This post is stunning! Love the photos. The detailing in these garments is amazing. you have a great sense of style!